Why is it that we understand the power and importance of light for the world around us, but we don’t appreciate the effect it can have on humans? We understand how light affects the world, the earth, the sea, the depth of the earth that we cannot reach, and just about anything we comprehend globally. But the medical field is yet to fully comprehend or embrace the power that light has over us as humans. Flavia Schlegel, Assistant Director-General for Natural Sciences spoke at the Internal Year of Light conference in Merida, Mexico in February 2016.. Schlegel discussed the importance of light therapy being cost effective and practical for the 2030 Agenda for Sustainable Development. The world inside of us is just as important as the world around us. Light therapy can help us effectively manage the world inside of us. Conditions such as emotional trauma, autoimmune problems, allergies, metabolic imbalances, seasonal affective disorder, jet lag, sleep and attention deficit disorders have been showing better results with the use of light therapy than other medical options such as medicines and surgeries. Bien claims that there are very good reasons for this, but the medical world hasn’t quite explored it yet. “On the ‘ground level’ where life in our bodies unfolds, light and colour have more say than chemical compounds which we concoct. Our cells naturally understand the language of light and its messages – which the colours convey through their frequencies – to ignite, burn, sizzle, scorch, smoulder or go off. That’s the same cycle the stars in our universe undergo. “I’m often asked how colour light therapy really works. It appears esoteric and mystical, bordering on magic. The best analogy I know – one we all know well – is fire. “Fire is quirky. It is our species’ first tool, process and weapon. It gives off light and heat on demand, echoing our life-giving star in the sky, and we get to wield it at will. If you look closely, it varies in colour, depending on intensity. At first, it’s yellow and orange; green flame tips and blue-ish bursts will tell you it’s sizzling; you’ll want it bright white, though, if you wish to melt metal or bake clay. “Still, starting and maintaining a fire is tricky, at best. It’s moody. It might flare up in an instant or just smoulder for hours. Sometimes, a trained hand gives up in frustration; another time a fire will light itself up. Too much moisture around it and it won’t even start; too little and it burns itself out. “So it is with us. We are internal combustion engines, with trillions of tiny burners. Our cells burn up oxygen and produce heat. They use the resulting light as an ultra-fast messaging system. It all works to perfection – from toes to teeth – except when it won’t. “When an imbalance sets in, our internal flame in an organ dies down. Or it flares up, past all safety limits, causing redness, fever and pain. We don’t know what triggers this any more than we can pinpoint the cause of a wild forest fire or control it. Bien sells handheld color light therapy devices that she believes are even more effective than normal light therapy. 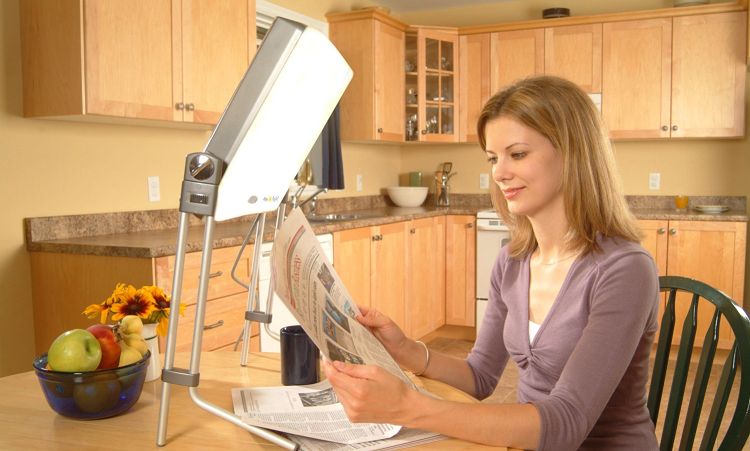 Most light therapy devices output a bright light, with a wide surface being covered, in just one direction. Handheld color light therapy illuminators “work off the silent communication between the person sending faint light and the person receiving it”, according to Bien. The concept of color light therapy is an ancient finding. Records exist from thousands of years ago that show conditions and disorders being effectively cured with color light therapy practices. This form of therapy is harmless and brilliant, but the world seems to have forgotten the importance of this discovery over time. If an equal amount of time and money that is used for chemical drug experiments was used to further research color light therapy, the world would quickly become a much healthier – and brighter – place. When discussing light therapy, children aren’t typically brought up in conversation. It’s easy to assume kids are primarily happy. Children would seem to have far less to worry about day-to-day. They can power through just about anything, have endless energy, and they wake up ready for the day. Most of the time…. But kids are sensitive to the world around them, too. In fact, some things may be more difficult for children to deal with because they are not old enough to understand what’s happening. Children can be just as easily affected by the outdoor weather, seasonal changes, jet lag, depression, and skin conditions. Light therapy is equally as important and ground breaking to children as it is to adults. Seasonal affective disorder, or SAD, is a form of depression that occurs in the fall and winter months as the days become shorter and the nights become longer. When this seasonal change occurs it’s hard to keep our body’s internal clocks or circadian rhythms in check. The change typically results in decreased moods, low energy levels, trouble sleeping, and more. The depression begins to subside in the spring when the days start to become longer again. Anti-depressants prescribed for depression are dangerous for children and not recommended. This is where light therapy comes into play. Drug-free, harm-free, all natural treatment sessions can raise children’s energy levels when they need it the most. Color light therapy has a wide array of benefits for children as well. This form of light therapy shines different colored lights into children’s eyes to stimulate the brain and enhance it’s functions. Unlike light boxes used for SAD and similar conditions, colored light therapy is medically supervised. Doctors guide their patients through a series of therapies involving many different colors of light. This form of therapy has been proven successful in treating many different conditions and disorders from allergies, to vision improvements, to speech problems, and more. Body: Light Therapy eliminates physical problems such as fatigue, insomnia, hyperactivity, poor coordination, balance difficulties, autonomic and endocrine imbalances. Spirit: Light Therapy gives the soul back its light and helps the spirit soar. It takes the innate energy of the child or youth, which the mind sends out into the world, and grounds it more deeply into the soul. It allows the child or youth to control their energy instead of the energy controlling the child. Mind: Intellectual difficulties are lessened; including poor reading comprehension, pronunciation, concentration, memory, organizational ability, and mathematical ability. Emotions: Emotional problems are reduced or eliminated; including low self-esteem, depression, fears and anxieties, SAD (Seasonal Affective Disorder). Social: When the body, mind and emotions of a child are functioning optimally and the spirit is soaring, social interactions will be appropriately smooth and rewarding. Light therapy is safe for children and is a wonderful and effective alternative to medication. If your child or someone you know is struggling with any of the disorders or conditions discussed, light therapy might be a good option. Give it a shot! Autism spectrum disorder or ASD is a term used to describe a group of disorders. These disorders include Aspberger’s syndrome and pervasive developmental disorder, known as atypical autism. The most commonly occurring form of Autism spectrum disorder is autism. The symptoms that are brought about by ASD are seen early on in childhood which is why it is called a developmental disorder. The word spectrum is used to describe the disorder because the symptoms, severity, and intensity can greatly differ between children. On average, 1 in 160 children will be diagnosed with ASD. Boys outnumber girls 4 to 1. 75% of these children have low intelligence levels while around 10% show high levels of intelligence typically in mathematics and computer sciences. Some children have incredible abilities in fields such as music and memory. Children with autism spectrum disorder do not have easy lives. Consider most people’s daily struggles and then add ASD to it. When the natural ways of the world weigh on their shoulders, life can get tough. Light therapy is known to treat conditions such as seasonal affective disorder, depression, insomnia, chronic pain, skin conditions, and more. When children struggling with these conditions are also battling ASD daily, they need a little help. This is where light therapy comes into play. “Phototherapy (also called “light therapy”), which involves exposure to artificial light, is quickly becoming a popular way to treat seasonal affective disorder (SAD) in children on the autism spectrum. SAD is a type of depression that occurs at a certain time each year, usually in the fall or winter. During phototherapy, your child sits near a device called a light box. The box gives off bright light that mimics natural outdoor light. Generally, most children with SAD begin treatment with phototherapy in the early fall when it typically becomes cloudy in many regions of the country. Treatment usually continues until spring when outdoor light alone is sufficient to sustain a good mood and higher levels of energy. If your child typically has fall and winter mood problems, behavioral issues or depression, you may notice symptoms during prolonged periods of cloudy or rainy weather during other seasons. You and your physician can adjust the light treatment based on the timing and duration of your child’s symptoms. Light therapy treatments are most effective when there is a perfect combination of three key elements. These elements are timing, light intensity, and duration. Timing is most effective when done in the morning. It is recommended for children to begin their light therapy treatment session as soon as they wake up. Eating breakfast or reading in front of the light box is a good option to keep this a routine. When it comes to intensity, light boxes are measured in lux. Lux is a measure of the light received from the light box from a certain distance. Boxes usually range from between 2,500 lux and 10,000 lux. The distance the child can sit away from the light box depends on the level of lux as well as the session time required. For example, a light box that emits 10,000 lux will probably only require a 30 minute treatment session. A light box that emits 2,500 lux will probably require a session close to two hours. It’s important to consider a child’s energy and patience levels before purchasing a light box. The third key element is timing. It’s important to discuss this element with a doctor. During the beginning stages of treatment, a shorter time frame is typically recommended. For example, 10 minutes. As daily sessions continue, the time frame can lengthen. Light therapy requires time, routine, and scheduling. It’s important to find a light therapy box that fits complacency into a child or teenager’s lifestyle. While phototherapy/light therapy doesn’t necessarily cure seasonal affective disorder, depression, insomnia, or any other similar conditions, it does ease symptoms, raise energy levels, boost confidence and increase happiness in children. But most importantly, it can improve the quality of life for a children struggling with ASD. Is it time for someone you love to try light therapy?